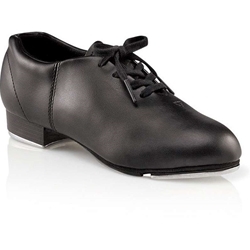 The Capezio child fluid tap shoe is perfect for young dancers who are just starting out with tap. The shoe is available in black child size 10M – 2.5M. Girls order street shoe size, boys order two sizes up. The Capezio adult fluid tap shoe features a soft quality poly synthetic (PU) upper, Tele Tone® heel and toe taps pre mounted on resonant fiberboard, moisture absorbing microfiber linings, suede flexible outsole with light Texon® board shank for flexibility with support, and folded edges and padded collar for comfort. This is a great starter shoe that is less expensive than other tap shoes making it perfect for students. Many dance schools and dance studios choose this style for their intro tap dancing classes. This shoe is also available in caramel and wide widths by special order. Please call 1-877-218-1289 for more information.